Mesothelioma is a cancer that occurs in the mesothelium, a thin membrane encompassing the body‘s internal organs and cavities. Mesothelioma is caused by asbestos exposure. 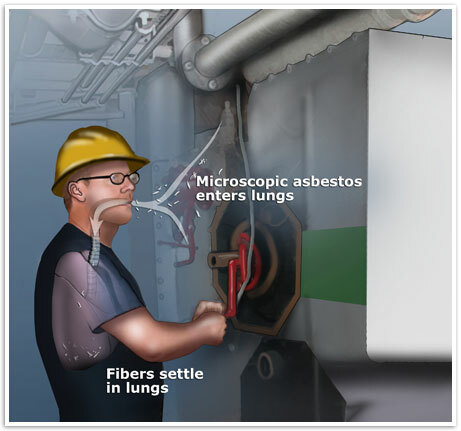 Asbestos fibers that are inhaled through the mouth and nose may eventually become embedded in the lining of the lungs, causing harmful inflammation of the pleura and resulting in mesothelioma or asbestosis (scar tissue formation in the lungs). It has also been found that swallowing asbestos fibers could contribute to a form of the malignancy originating in the abdomen known as peritoneal mesothelioma. Mesothelioma generally results from occupational asbestos exposure, but there are instances of environmental exposure that can also cause the disease. Often times a family member can be affected indirectly by secondhand exposure from an asbestos worker‘s soiled work clothes. Asbestos was an effective insulation material. It was used liberally in commercial and industrial products in the United States until being regulated in a joint effort between the Consumer Product Safety Commission and the Environmental Protection Agency in 1989. Occupational exposure was common among workers who encountered these products in many industries including shipbuilding, power plants, and other industrial settings. Asbestos insulation workers appear to have the highest incidence rate of asbestos-related disease. One study reports that almost six percent of asbestos workers fall victim to mesothelioma or experience respiratory symptoms. Asbestos insulation workers are over 300 times more likely to be diagnosed with mesothelioma than those with no exposure history. How does exposure to asbestos cause mesothelioma? Asbestos fibers are microscopic, though they are also quite durable. For this reason, asbestos was used in a number of different industrial compounds to enhance strength and resistance to temperature extremes- two properties at which the mineral is highly adept. Asbestos exposure most often occurred among individuals who worked extensively with asbestos or asbestos-containing materials. Friable asbestos (meaning loose or airborne fibers) is easily inhaled- often without the exposed person realizing. When inhaled, asbestos lodges easily in the outer lung tissue and within the mesothelium. The mesothelium is a thin membrane of cells which produces a lubricating fluid on the surface of the organs. This lubricant allows the lung and other internal structures to expand, contract, and move freely without friction in the body cavity. There is a great deal of latency associated with mesothelioma between exposure to asbestos and the onset of symptoms. Pleural mesothelioma is the most common variety of the disease and forms on the pleural membrane, which surrounds the lung and chest cavity. Peritoneal mesothelioma is less common and forms on the surface of the peritoneum, a thin membrane surrounding the abdominal cavity. Pericardial mesothelioma is the least common variety of the disease and forms in the cardiac cavity that envelops the heart, a mesothelial membrane known as the pericardium. Inhaled asbestos fibers are known to be the cause of pleural mesothelioma, whereas ingested asbestos fibers are the cause of peritoneal mesothelioma. While the exact causal nature between asbestos and pericardial mesothelioma is not known, physicians and cancer researchers surmise asbestos fibers in the blood stream lodge in the outer layers of the heart‘s ventricles and lodge in the pericardium. Once asbestos fibers reach the surface of the peritoneum or pericardium, the inflammation process is essentially the same as it is on the surface of the pleura. Primary workplace exposure to the mineral was common in naval shipyards, power plants, railroad infrastructure, and other industrial jobsites. However, asbestos-related mesotheliomas have also been diagnosed in spouses or children of those exposed to asbestos. Workers often brought home dangerous asbestos fibers on their clothing, hair, or person. Those who came into contact with these fibers on the person or their clothing have developed mesothelioma as a result. © 2015 Diagnosos Mesothelioma. All Rights Reserved.